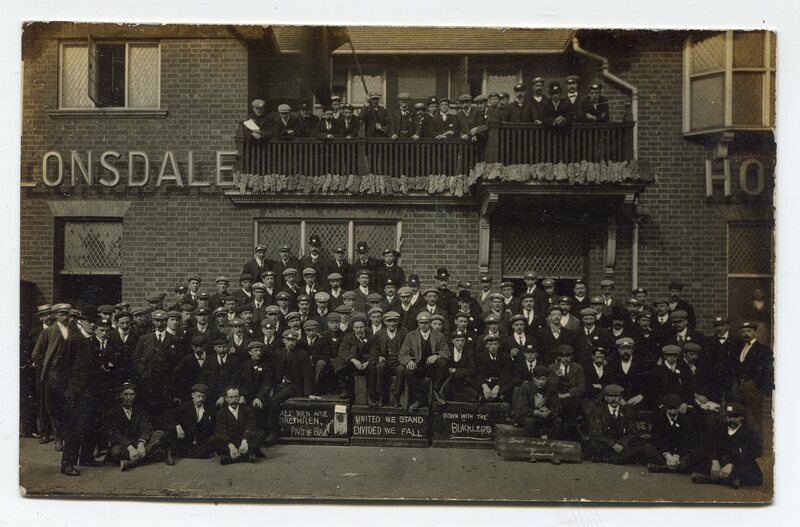 Brush Strikers meet outside the Lonsdale Pub in 1906 Postcard image scanned by collector Heather Copley. In June 2014, the Loughborough Archaeological and Historical Society (LAHS) Committee received a photocopy of an old black and white postcard from Heather Copley, a collector from Leighton Buzzard, with a request for information on the event shown in it. 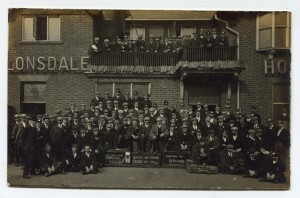 The image is of a group of men, each with a ticket in their headwear, grouped outside a pub named ‘the Lonsdale Hotel’. The men sit and stand around boxes chalked with the words ‘united we stand, divided we fall’, ‘down with the blacklegs’ and, most intriguingly, ‘all men are brethren’, with an arrow pointing to what appears to be a lump of coal above the caption ‘part of black’. A young man on the right rests a board across his feet with the words ‘sent out of Falcon, victimised’ in cursive writing. A shadowy figure of a pot man can be seen in the right-hand window. Heather bought the postcard in an album of cards at Tring Market Auctions and though the reverse was un-used and bears no postmark, it is subdivided and printed with the words ‘for Inland Postage’ which, she estimated, placed the event between 1904 and 1909. A number of the other cards in the collection were of Loughborough and this prompted Heather to begin her investigations in the same area. An internet search confirmed the existence of a Lonsdale Hotel in Loughborough and a quick look at Burder Street on Google Earth Street View showed it to be the same building as that in the photograph. Hence Heather contacting the LAHS. The LAHS Committee contacted local historian Tony Jarram, who was able to confirm that the picture was related to a strike at the Brush Falcon works, and to provide Heather with the following background information. London County Council (LCC) went even further and set out rates and hours which were inserted in and formed part of every contract. As a result, Brush failed to get LCC contracts and received complaints from Manchester. Two of Brush’s competitors went into liquidation and at the 1905 AGM it was announced that Brush had increased Rolling Stock and Tramcar orders had decreased from 1900 to 1904 by five times. Brush paid a 6% on preference shares and a 2.5% on ordinary shares. The workforce increased considerably, with some new recruits coming from the closed tramcar manufacturer G F Milnes. Union membership, hitherto rather low at the Brush, increased during 1905-06 and the United Union of Coach-makers felt strongly enough to present its demands for ‘Lancashire Wages’ to the Brush management who were paying 4s per week less than the competitor United Electric Car Co. at Preston. Brush contested that living rates were lower in Loughborough and refused to negotiate, and in September 1906 the Union brought its 200 members out on strike. The Lonsdale Hotel in Burder Street was opened on the 16th February 1898. It closed in 2001. Find out about the history of the unions and about how to read the history of old postcards. Do you have any information you can add to this feature? If so, contact us at history@lboro.ac.uk. Information source: the Brush Electrical Engineering Company Limited and its Tramcars by J H Price, Tramcar and Light Railway Society, 1976.